Helen Fitzgerald loved unique cultures, exotic places and interesting people. She spent 60 years traveling the world and building a collection of memories, souvenirs and artifacts that now serve as teaching tools. 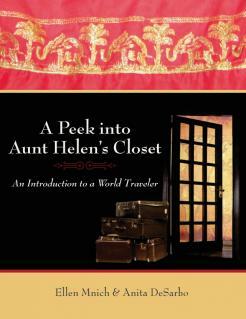 In A Peek into Aunt Helen's Closet, Aunt Helen takes one on an exciting journey, weaving stories around her vast collection of exotic clothing and souvenirs. An ordinary woman living an extraordinary life, Aunt Helen's escapades engage readers of all ages in lessons of cultural diversity, tolerance and the sameness of people around the world. Aunt Helen's Closet has been featured on WTEN-TV/ABC 10's Children First program and has appeared at schools, libraries, nursing homes, churches, group organizations, conferences, museums, universities and colleges. Ellen Mnich has distinguished herself as a teaching artist and storyteller bringing to life the adventures of her Aunt Helen. For 15 years she has brought her museum approach to education throughout the Northeast to libraries, schools, museums and conferences. She is a member of the National Storytellers Association and Association of Teaching Artists. She was the recipient of the 2009 Girl Scout Award for Distinguished Women. Anita DeSarbo, MSED, has worked with Mrs. Mnich to develop a portfolio of lessons designed to build language and literacy using storytelling, artifacts and literature as teaching tools. She has experience as a reading teacher, literacy and curriculum specialist and coordinator of academic programs. She is presently working at the Child Research and Study Center at the University at Albany on a project related to literacy instruction.